2 Barbieston cottage is a beautifully converted barnhouse offering flexible open plan accommodation over two levels. The property’s semi rural location will suit those seeking the quiet country lifestyle whilst offering deceptively spacious living. The accommodation on offer comprises lounge, open plan kitchen /diner/sitting room, four bedrooms, bathroom, and a floored attic space currently utilised as an office. In summary the ground floor layout extends to entrance hallway leading to the stylish living room with patio doors to the south facing rear garden. The kitchen area is open plan to a further sitting area, with dining room and in house bar area, complete with wood burning stove. The kitchen is modern in style with fully integrated induction hob, fridge, freezer, microwave and oven. There are two double bedrooms on the ground floor, and a stylish bathroom complete with roll top bath, separate walk in shower enclosure, WC and WHB, all finished to modern tiling. Stairs lead to the upper levels with two further bedrooms, and a floored attic space currently utilised as an office. Externally to the front there is a shared courtyard area. To the rear the garden can be accessed via the bi fold doors off the dining area. The garden is laid predominantly to lawn with off street parking and countryside views. The property benefits from oil central heating, double glazing, and solar panels. 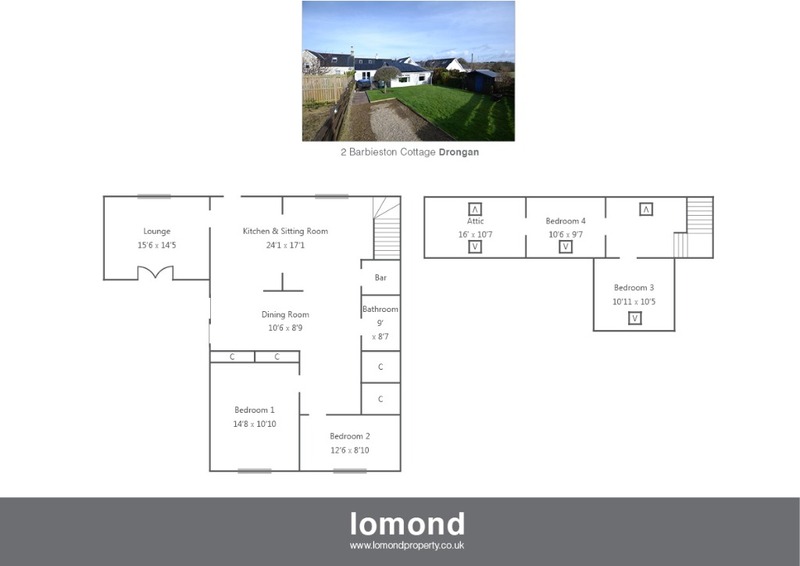 The property is located in the countryside just outside the villages of Drongan and Coytlon. Ayr is the nearest major town, situated just 6 miles away. Ayr has a number of bars, restaurants, coffee shops, and retail parks.